The Annual ProgPower USA Festival has broken all records with its ticket sales for the 2016 installment, officially selling out next year's event in just 9 hours! 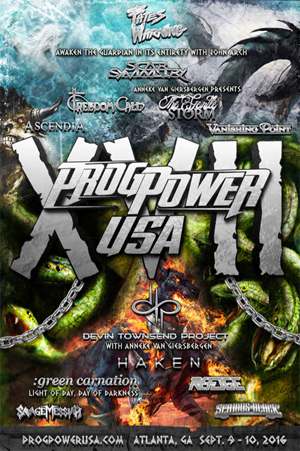 "We are truly humbled to say ProgPower USA XVII sold-out in a mere 9 hours. This destroys all sales records in the entire history of the festival. From the bottom of our hearts, we thank you." ProgPower USA 2016 saw 60% of the available tickets sold within 30 minutes. Tickets were scheduled to go on sale at 9pm on Saturday, October 3rd, but a Ticketmaster glitch delayed online sales by almost an hour, which did nothing to slow the pace of sales once the glitch was fixed. ProgPower USA enters its 17th installment next year with DEVIN TOWNSEND PROJECT, SCAR SYMMETRY, GREEN CARNATION, FREEDOM CALL, THE GENTLE STORM, LORD, VANISHING POINT and many more appearing at the festival, which also includes a special performance from John Arch-fronted FATES WARNING performing Awaken The Guardian in its entirety.